1. Spray a muffin pan with non stick spray and preheat oven to 350. 2. In a medium bowl, gently mix berries, sugar and lemon zest. 3. Roll out crescent rolls and press seams together. 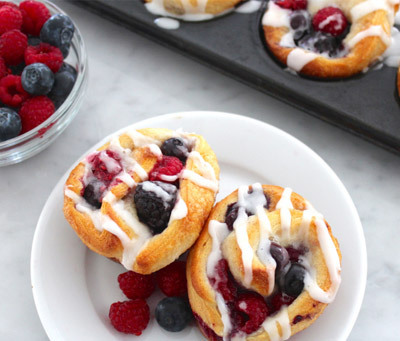 Spread berries over the dough and gently roll up. 4. Cut into 8 equal pieces. Place each piece, cut sides up and down in a well of the muffin pan. 5. Bake for 14-17 minutes or until golden brown. While they are cooking, whisk together powdered sugar and on tablespoon lemon juice and more if necessary until it is toothpaste consistency. 6. Remove from buns from oven and run a knife around the edges. 7. Drizzle glaze over the muffins.